Book Details: Book dust cover shows some dents, small tears, handling marks, smudges and wear. Some edge wear, especially the corners. Book itself is in really nice condition. Shows very little use and binding is excellent. Good reference book for the Winchester collector. 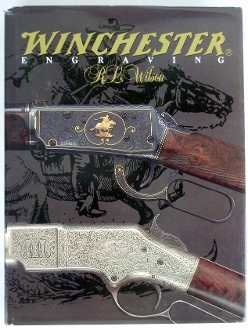 Book includes some pictures of engraving from Nimschke & Ulrichs of Winchester Henry, Winchester 1866, Winchester 1886, Winchester 1876, Winchester 1885, Winchester 1895, Winchester 1892, Winchester 1894, Volcanic and more. Excellent book showing the craftsmanship and art of Winchester engraving. Hard cover about 9 ½”x 12 ½”.